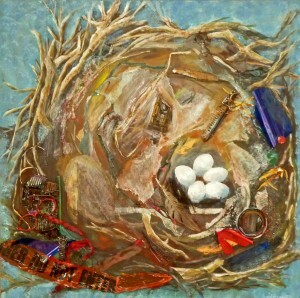 This piece was inspired by a photograph by Sharon Beals in 50 Nests and the Birds That Made Them. All of the trash was picked up within 2 blocks of my home on a short walk one afternoon. There is recent research saying birds are putting cigarette butts in their nests and the nicotine works as an insecticide decreasing the mites. But the researchers are quick to add there may be negative consequences as well. Cigarette butts are the top waste found during the Great Canadian Shoreline Cleanup. People have made art from cigarette butts, and I’m considering it.